A good friend recently had her first child. She and her husband love Toronto. When they were married a few years ago, their wedding invitation was a beautiful hand drawn Toronto skyline, made by the groom himself. It has been very difficult to buy her a gift since she really isn't into baby "stuff" and she really doesn't like animals. An interesting combination since basically everything made for babies is both cutesy and covered in animals. After turning the gift problem around in my head for a week or two, I realized that I wanted to make them a hand quilted, whole cloth Toronto skyline quilt. My friend loves the colour green so I picked out some amazing shot cotton in a gorgeous emerald colour for the back and a soft white print from Lecien for the front. 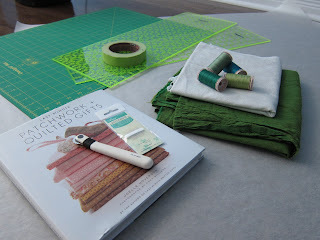 I chose four different colours of hand quilting thread in shades of green and turquoise. I drew an image of the skyline on tracing paper and transferred it the quilt top. I hand basted the quilt together and now, after about 6 months of prep work, I am finally ready to start quilting it. This project is a bit of a personal Everest for me. It is the first time that I have made my own pattern from scratch and the first time that I've done any hand quilting. I'm sure that it is going to be wildly time consuming but extremely satisfying. I'm really hoping to get it finished before the end of August. If I can figure out how to manage an 11" x 17" Q-snap frame, scissors and thread on the plane then I might actually get it done. Wish me luck!